I'd like to take a moment to tell you all about the book I'm reading and thoroughly enjoying. 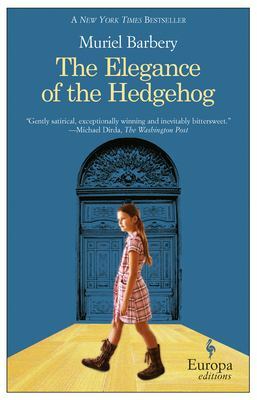 It's The Elegance of the Hedgehog by Muriel Barbery. The story is narrated by two very different, yet similar characters (and can I tell you how much I love stories with multiple narrators?). Paloma is a twelve-year-old genius, who lives with her parents in an upscale Parisian hotel. Instead of flaunting her intelligence, she hides behind it, only letting her true self shine through in what she writes. With a calm and matter-of-fact attitude, she decides that on her thirteenth birthday she will commit suicide, because she does not want to lead the same meaningless life as that of the adults she knows. Renée is the other narrator, and she is the concierge of the hotel which houses Paloma and her family, among others. Her life is also a facade, in which she hides behind the image of a typical concierge. Physically, she fits this role, however, her hunger for knowledge and culture contradict it. She reads everything from philosophy to Russian literature, and devours film after film. All the while she makes every effort to appear simple and forgettable. I just got to the part where a new tenant arrives at the hotel, a Japanese gentleman, and he intuitively recognizes that neither Paloma nor Renée are who they claim to be. I can't wait to find out what happens next! I realize this has nothing to do with clothes, but sometimes a book is so good you just want to gush about it. Thank you for letting me do that! Love the belted cardi...I know what you mean about a good book...its kinda like wanting to tell the movie line before others have watched it, lol...Im the same way...wish I had more time to read....your book sounds awesome!! Oh the song Strawberry Wine, I love it! Reminds me of the summer before I left for college. This book sounds great! I will be recommending it to my book club for our next pick. I just found your blog through a comment you left on ours. I have to tell you I love love your hair! I have been thinking about doing something similar once it warms up a bit - thanks for the extra inspiration to do it! love your necklace girl!! i need some more fun colored ones like yours!! I love that necklace! And I love getting new ideas for books to read. That book sounds so good! i love your look. ill have to check out the book! That cardi looks so cozy! You're making me want to carve out some time to read tonight! The book sounds great! Will have to download it! I love the outfit - especially the shoes! I so wanted them but they were sold out in my size. :( They look great on you! Sounds like an awesome book. I'm still in my book-turned-movie phase (just finished The Romantics, onto It's Kind of A Funny Story), but will definitely check this one out once I finish with that. I'm always down for a good book suggestion! I've been thinking about reading this book for over a year now. Glad to hear you're enjoying it. I love the look of this chunky sweater with a belt! That really makes it very slimming. Thanks for the book suggestion! I'll have to check it out.